All-Inclusive vacations are perfect for Honeymoons, Destination Weddings, a couples getaway, a family vacation and more! You can vacation in paradise with or without kids. Below are just some of the all-inclusive resorts you can choose from, many others are available! Click on the photos for more information on the resorts! Beaches resort which has been voted the "World's Leading Family All-Inclusive" with water parks, unlimited land and water sports and dining and entertainment all included. 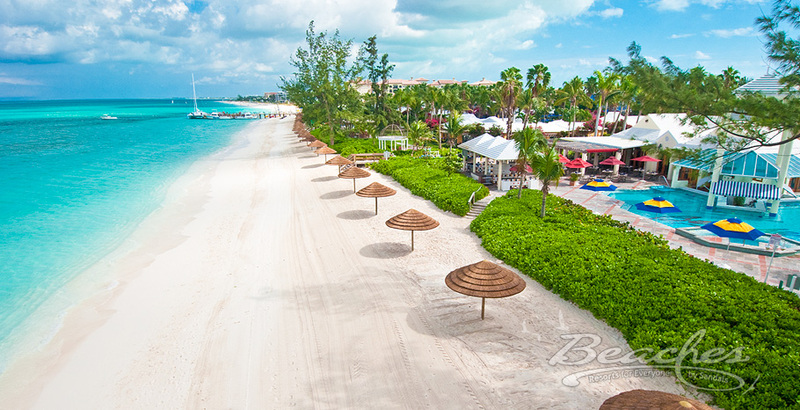 Beaches has resorts in Turks & Caicos, Ocho Rios, Jamaica and Negril, Jamaica. Sandals Resorts features "More Quality Inclusions Than Any Other Resorts on the Planet." At Sandals, a couples only resort, "Love is all you need"! At Sandals it is all included, all unlimited, all the time. That means no government taxes, no transfer fees, no premium drink charges, no upgraded activity charges, no specialty dining up charges, and no tipping. There are no hidden charges! Sandals has locations in Jamaica, Antigua, Saint Lucia, Bahamas, Grenada and Barbados. With Sandals, "Paradise is closer than you think"! AMResorts is a collection of luxury resort destinations, each with its own unique personality. Every one of our resorts features sun- soaked beaches, elegant accommodations, a world-class spa, gourmet dining, unlimited premium drinks, and many other pampering amenities. Resort brands include Secrets, Dreams, Zoetry and more. Island Resorts has an impressive collection of Caribbean properties. From the island of Tortola in the British Virgin Islands, Antigua, steeped in history, the hidden beauty that is Barbados, the lush and tropical St. Lucia or Palm Island, their private island paradise in the Grenadines, they have a place for everyone. Their resorts include Galley Bay Resort & Spa (adults only), St. James Club, Palm Island Resort(adults only 12+), Long Bay Beach Club and others! Palace Resorts features five resorts for families to choose from and three resorts reserved exclusively for couples. They have resorts in Cancun, Playa del Carmen Mexico, Cozumel Mexico, Isla Mujeres Mexico and Ocho Rios Jamaica. "Live the Palace life." Couples Resorts - Welcome to Endless Possibilities! Transform your next vacation into a romantic getaway at one of our four all-inclusive resorts in Jamaica—where world-class amenities such as our superb spas blend effortlessly with the islands' most idyllic beach settings and local charm. We invite you to enjoy the finest cuisine prepared with fresh homegrown ingredients and tantalizing Caribbean spices. Dive into a paradise of water sports and activities from scuba diving to reef snorkeling. Our team of instructors is ready to help you perfect your game of tennis or golf with a lesson. And it wouldn't be a real Couples vacation without watching a sunset aboard a catamaran, tropical cocktail in hand. It’s private butlers and personal concierges who attend to your every wish. And culinary masters who never cease to amaze. It’s beachfront boutique hotels, private villas and lavish resorts. And swim-up suites and bars, canopied beach beds and beachfront Sky Massages that make you beg for one more day. It’s weddings, honeymoons, romantic inter-ludes and family time. And it’s clubs for teens and kids designed to keep everyone happily engaged. The Gourmet Inclusive® Experience. Only at Karisma Hotels & Resorts. Resorts Include El Dorado, Azul, Allure and Generations Resorts.